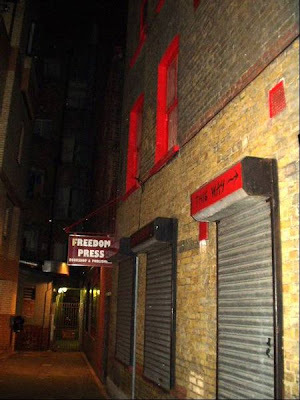 "Freedom Press, which comprises Freedom Newspaper, Freedom Bookshop and Freedom Publishing, is a longstanding anarchist publisher based in Whitechapel, East London. Founded in 1886 it offered a much needed outlet for radical ideas and a meeting place for the anarchist thinkers of the day, and we seek to continue that tradition today along with promoting and supporting current social and political struggles. We are the largest anarchist publishing house in the nation and the oldest of its kind in the English speaking world. We publish a range of radical literature including classics from such anarchist heavyweights as Kropotkin, Malatesta, Rudolph Rocker, Alexander Berkman and Colin Ward, to the history of the Spanish revolution and the Makhnovist movement, as well as biographies on Zapata, Bakunin and Nechaev, George Orwell, Willliam Godwin and William Blake, and is home of the ever popular Anarchist Quiz Book. Alongside books, we also publish a fortnightly newspaper which remains the oldest and only regular anarchist newspaper in circulation in the UK. It covers all aspects of the anarchist movement as well as news and issues, from a radical perspective, relevant to people’s everyday lives."